La-La Land Records, Sony Music and Warner Bros. present the first expanded and remastered release in a special line of titles celebrating the 90th Anniversary of Warner Bros. -- John Williams' original motion score to the acclaimed 1997 Warner Bros. feature film ROSEWOOD, starring Jon Voight, Ving Rhames and Don Cheadle, and directed by John Singleton. Mr. Williams' work here is a wonder - a hauntingly beautiful fusion of blues, jazz, gospel and traditional film scoring that is as deftly subtle as it is powerful. 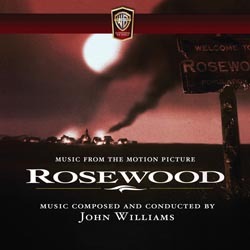 Greatly expanded from its initial soundtrack album, this is the definitive release of the ROSEWOOD score, featuring the instrumental score on Disc 1 and the remastered original 1997 motion picture soundtrack on Disc 2. Produced by Mike Matessino and Didier C. Deutsch, and mastered by Mike Matessino, this special release is limited to 3500 units and features exclusive in-depth liner notes by film music writer Jeff Bond.